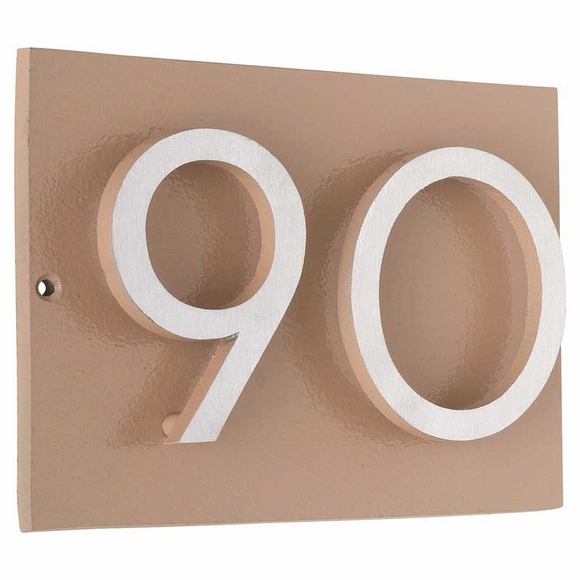 Address Plaque with 2 Offset Numbers - - holds two bold 3" or 4" dimensional characters with a contemporary flair. Designed for an address number or room number with 2 digits. Horizontal or vertical orientation. Made in USA. Our newest ultra chic address plaque is a high-quality, contemporary custom sign without the wait usually associated with a personalized product. Generally ships direct from factory in just one day. Forged in recycled aluminum and finished with a durable two-part paint, this plaque will add beauty to your home for years. Features two raised solid cast aluminum 3" or 4" high number on a 1/4" thick solid aluminum backplate with either a horizontal orientation or vertical orientation. The numbers are securely fastened to the plaque on the back side with screws that are countersunk to conceal them, as shown in the two small images on the far right. Durable, UV-resistant, automotive-grade urethane two-component finish provided by PPG Industries. With more than 50 color combinations, including awesome two-tone dimensional numbers and upscale combos with brushed aluminum, you'll have the opportunity to create a one-of-a-kind style statement. Two-tone means the color on the sides and rear of the number will be the same color as the backplate. Brushed aluminum numbers are polished for 14 hours once complete. Ten backplate colors: black, gray, hunter green, navy, brick red, roman bronze, sand, white, sea blue, and taupe. Six number colors: black, gold, silver, white, satin nickel two tone, and brushed aluminum. For the best visibility, pick different colors for the backplate and numbers. Do not pick a black backplate & black numbers or a white backplate & white numbers. with 3" numbers: 4.5"H x 6.375"W x 1" thick. with 4" numbers: 6"H x 8.5"W x 1" thick. with 3" numbers: 7.5"H x 3.375"W x 1" thick. with 4" numbers: 10"H x 4.5"W x 1" thick. Address Plaque with 2 Offset Numbers holds two 3" or 4" dimensional characters. Made in USA. Our newest ultra chic address plaque is a high quality, contemporary custom sign without the wait and at an incredible price.